We appreciate your feedback about your support experience with WooCommerce, developers of Bookshop. This helps us maintain high standards on the WooMarketplace, and helps WooCommerce improve. Bookshop comes with a unique homepage layout that prominently displays product categories and a variety of products in an arrangement that is popular with bookstores and collectibles. Bookshop is a Storefront child theme that has been designed to be used by book stores. It features a classic design to present books or other collectible products, such as wine. 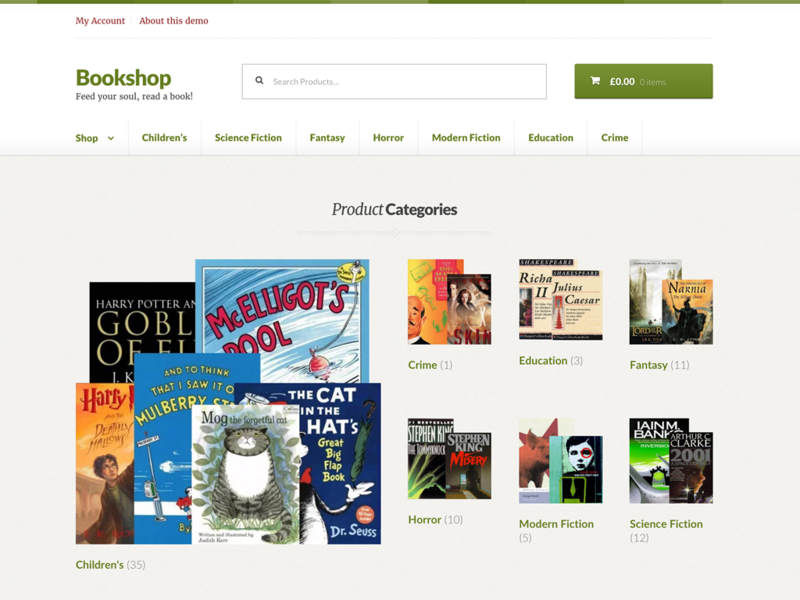 Bookshop is built on the robust Storefront core parent theme that you know and love. Enjoy 100% compatibility with the latest version of WooCommerce and customer-facing WooCommerce extensions. Have bigger ambitions? Install Storefront Mega Menus and take your Storefront-powered online shop to the next level instantly, with no cheat codes required.